There is no doubt that one of the most significant technological advances in law enforcement over the last twenty years has been the development and deployment of Electronic Control Devices (EDC’s) for less lethal suspect management. The father of the modern EDC was the late Dr. John “Jack” Higson Cover, Jr., a nuclear physicist and NASA scientist. He envisioned an electric weapon that could immobilize a person without the harm of a firearm. 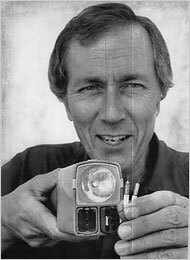 In 1974, Cover patented an ECD named after the 1911 novel Tom Swift and his Electric Rifle—hence the name TASER. Cover’s original TASER Systems TF-1 was classified as an NFA Title II weapon by the BATF based on the case design and because the electrified wire-tethered darts were propelled by a gunpowder charge. Further developments by Cover led to the TF-76 and TF-76A being classed as “handguns.” Sales of the new technology were therefore less restrictive. 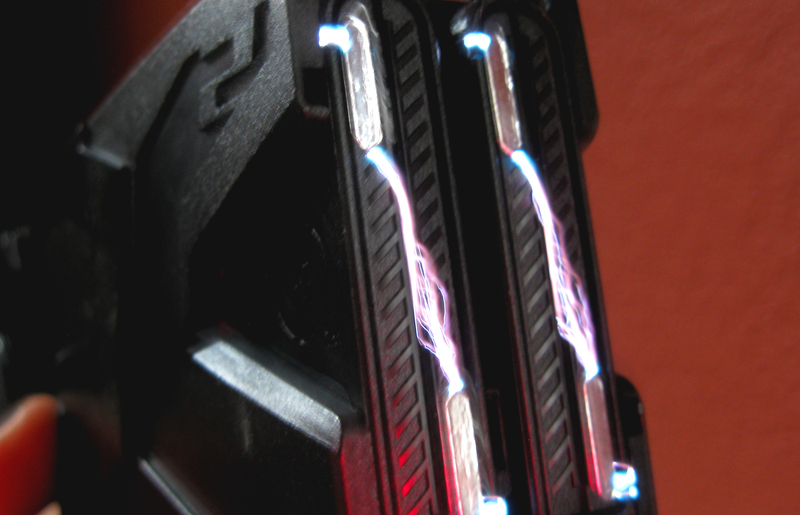 After TASER Systems went bankrupt, Cover sold its interests to an investor who marketed ECD’s under the name Tasertron beginning in the mid-1980’s. Their flagship EDC was the TE-86. Still gunpowder fired, the TE-86 was marginally effective. At my agency, TE-86’s were fielded by SWAT members and supervisors. The triggering device on the Tasertron was a rocker switch. Push right to fire the right side cartridge, push left for the other cartridge. The problem was that you had to push to fire the darts, but hold down the rocker switch to continue the electrical charge to the probes. I have one vivid recollection of a knife-wielding suspect being hit with a TE-86 in the late 1980’s. The sergeant, though trained, was not proficient with the ECD’s use. He pushed the right then the left rocker, but under stress he did not hold down either one. The suspect jumped into the air, having only been briefly stunned and now wearing four darts. Worse, the suspect had convulsed and grabbed the blade of the butcher knife he had been brandishing. I won’t forget the mix of anger and shock on his face as he stood there bleeding from one hand while holding the knife in the other. We eventually talked him into dropping the knife, but I thought we might have to shoot the guy. Jack Cover and brothers Tom and Rick Smith founded Air Taser, Inc. in 1993. Their first product was the 34,000 model. It projected darts with the use of compressed nitrogen instead of a gunpowder charge, relieving it of the firearm classification. We found better success with the Air Tasers than we had with the old TE-86’s. Still, there was room for improvement and in 1998 Air Taser became TASER International. 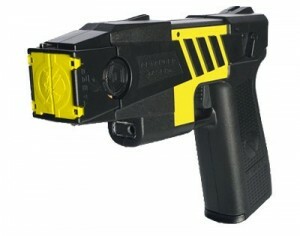 To better the breed, they came out with the Advanced TASER M26. The M26, at 26 watts of power, had better “electro-muscular disruption” than the 34,000, which had 7 watts. The M26 was also ergonomically designed to resemble a handgun, something that was more intuitive for a cop to handle. I did not like the battery trays in the M26. The officers sometimes cracked the trays when replacing the rechargeable AA batteries. Battery life was an issue and function checking an M26 daily was a necessity. On the street, hearing that slow “clack, clack, clack” meant you needed to transition to something else. 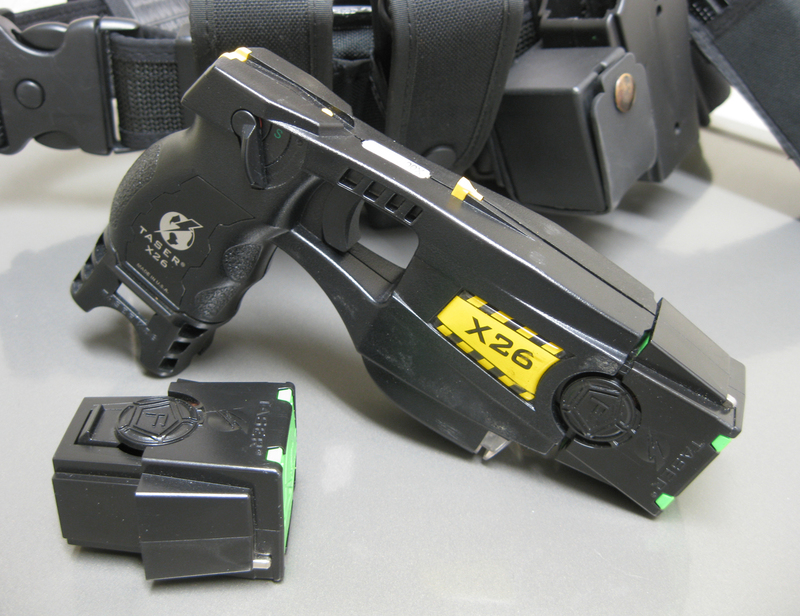 TASER International debuted the X26 in 2003. This was the period in which more TASERs began to see duty on the road. Whether or not the “Shaped Pulse Technology” was more effective, the smaller size and lack of battery recharging made the X26 popular with the rank and file. This was the first ECD issued to all our officers and another sergeant and I conducted the implementation training. We worried at first that all the officers having TASERs would result in suspects being “Spidermanned,” or trapped in webs of electrified wires from the officers deploying en masse. Thankfully, we were wrong. Our General Orders and Use of Force forms even included “pointing a TASER at the suspect” to gain compliance, which occurred more after combative criminals began “riding the lightning.” Our TASER X26 use has been infrequent, but generally effective when justified. The only knock I have to the X26 is the weak safety selector, which has been the most reported problem at our department. The plastic selector switch can break at the pivot point rendering the ECD useless. We have sent them back to TASER for this. Last year, I received a new TASER X2. 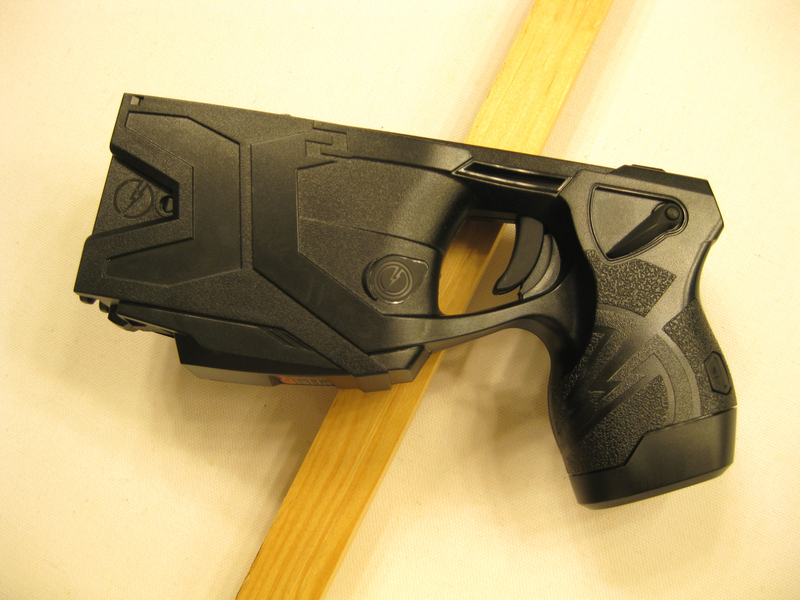 We looked at the TASER X3, but decided it crossed the line into prohibitive size. The X2 has a second shot capability and dual lasers for accurate probe hits. I had first seen a dual laser on the Tasertron TE-95, when I received their instructor training in the late 1990’s. TASER’s X2 is the cutting edge ECD at this time. We are slowly replacing our aging X26’s with the X2, which seems more durable. With only about a dozen issued to instructors and senior officers, we have yet to fully test its effectiveness on the street. Other companies have tried to break into the ECD market. Karbon Arms Inc., formerly known as Stinger Systems, and PhaZZer Electronics, Inc. are two that come to mind. Both companies have made agency sales, but they have not enjoyed the wide spread acceptance of TASER International’s products. Law enforcement methods of suspect control have come a long way from the days of the “wood shampoo.” Electronic control devices are evolving. The Military’s Defense Advanced Research Project Agency (DARPA) is studying ways to make a wireless ECD using an electrically conductive path between the device and the target. The Electronic Control Device has changed how police officers react to resistive suspects. ECD’s have been responsible for saving countless citizens, officers and suspects from unnecessary injury and death. Though they are not a stand-alone solution, ECD’s have evolved to become an integral presence on a patrolman’s gun belt. 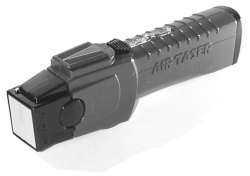 This entry was posted in Taser, Technology and tagged Air Taser, Electronic Control Device, Karbon Arms, PhaZZer, Police TASER, Police TASER Review, TASER International, TASER M26, TASER X2, TASER X26, Tasertron, Tom Swift and the Electric Rifle. Bookmark the permalink.